Regret.. the weight of the past. Every Toastmaster has three speeches, one that we prepared, one that was delivered and finally one that we wish we had delivered. This thing applies to many situation in our lives. 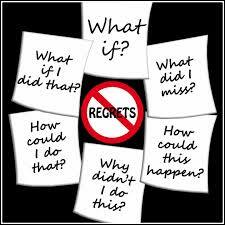 We all do things that we desperately wish we could undo, those regrets become part of who we are along with everything else. To spend time trying to change that is like chasing the clouds. Mine in particular, if only I had been more considerate…courageous.. honest whatever, and these I know tell on my life. Some how they all seem to surface when I am doing mundane jobs like kneading the dough or doing dishes. It’s like a weight that drags, everywhere I go. My major regret in life is giving considerable thought to inconsiderable people. So much my energy drains, feeding the old issues, .when we did address this issue at the Landmark forum, for a minute I was so insecure about letting this go, if I did let this go then what would I put in the vacuum? But I was nurturing a dead plant, creating further decay. Somehow the same situations would be recreated over and over, until I deliberately choose to move on. Though forgiveness is the most soothing balm, that can heal regret, for me it was closure and then forgiving myself. I actually discussed the issue with my inner child—that is my self from the past, asked forgiveness from myself and then flushed the clutter that I had collected. With my patients, there are times when we have done age regression, or inner child healing as the need arose. Since we are our harshest critics, it is amazing how powerfully healing it is when we can offer ourselves love. Previous PostPrevious Spirituality at workplace.